Our standard Linux webhosting offers include all the features you need to put your website online. For commercial use we also offer professional hosting packages. You are developing web pages using ASP.NET or MSSQL? 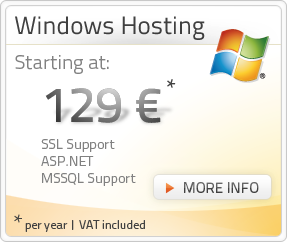 Then you will need a web hosting package based on Windows systems. Have a look at our Windows hosting offers. Do you need a special IT service but don't have enough technical knowledge to manage it yourself? Let us implement and manage it for you.